Particle-stabilized foams have attracted considerable research interest, due to their long term stability (months to years) and the possibility to use them as precursors for production of porous materials with hierarchical porosity. In our previous study [Lesov et al., J. Colloid Interface Sci. 504 (2017) 48–57] we clarified the role of the rheological properties of the foamed suspensions and the type of foam film stabilization in the production of porous silica materials with low mass density and excellent insulating properties. In the current study we extend our approach to prepare lightweight carbonate ceramics with controlled density, shrinkage and good mechanical properties. To prepare the wet foam precursors, we tested a series of eight anionic surfactants which were previously reported to provide sufficient hydrophobization of CaCO3 particles and long-term stability of the liquid foams. 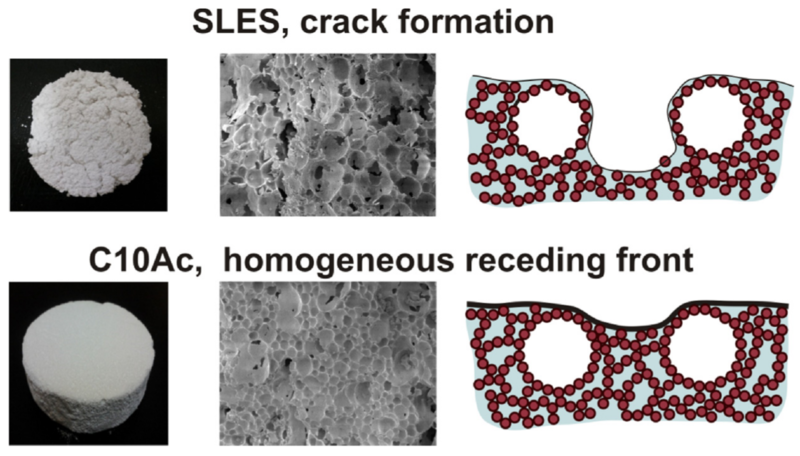 From those surfactants, the medium-chain fatty acids led to crack-free porous materials with superior mechanical strength, compared to the conventional surfactants. We study the reasons for the formation of cracks in drying Pickering foams and, on this basis, propose optimal conditions for obtaining dry porous carbonate materials with required porosity. Mechanistic explanations are proposed for the main observed ef-fects.